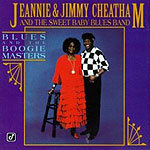 CD review: "Blues and the Boogie Masters"
San Diego's own Jeannie and Jimmy Cheatham and their Sweet Baby Blues Band are back with yet another standout recording, their eighth. Like the others, it's chock-full of their Kansas City style jazz/blues hybrid that draws from Count Basie and Jay McShann while updating the sound for the '90s. The Sweet Baby Blues Band is the best little big band in the business. Ex-Basie band member Snooky Young and Nolan "Cat Daddy" Smith hold down the trumpet seats; John "Ironman" Harris and Richard Reid anchor the swingingest rhythm section since Papa Jo Jones and Walter Page played behind Basie; and of course, Jeannie's piano and vocals are the livnig embodiment of the blues side of jazz. Jimmy Cheatham (who heads up the UCSD jazz program) still writes the tightest arrangements on the scene, and Hank Crawford fills the guest seat the Cheathams offer on each outing. New songs from the Cheathams include "Little Bitty Bluebird Blues," a 10-minute excursion allowing everyone to get plenty of solo room. And as always, there are several covers that show off Jeannie's prowess at interpreting others' work  in this case, Percy Mayfield's "Please Send Me Someone to Love" and Gene Austin's and Nathaniel Shilkret's "The Lonesome Road." There isn't a bad cut here, and the band swings as hard as ever. This is about as good an investment of your music dollar as you'll find.